Polbase - Reference: Crystal structure of a thermostable Bacillus DNA polymerase I large fragment at 2.1 A resolution. BACKGROUND: The study of DNA polymerases in the Pol l family is central to the understanding of DNA replication and repair. DNA polymerases are used in many molecular biology techniques, including PCR, which require a thermostable polymerase. In order to learn about Pol I function and the basis of thermostability, we undertook structural studies of a new thermostable DNA polymerase. RESULTS: A DNA polymerase large, Klenow-like, fragment from a recently identified thermostable strain of Bacillus stearothermophilus (BF) was cloned, sequenced, overexpressed and characterized. Its crystal structure was determined to 2.1 A resolution by the method of multiple isomorphous replacement. 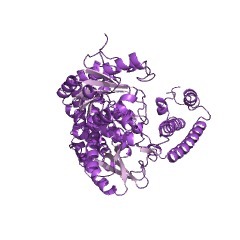 CONCLUSIONS: This structure represents the highest resolution view of a Pol I enzyme obtained to date. Comparison of the three Pol I structures reveals no compelling evidence for many of the specific interactions that have been proposed to induce thermostability, but suggests that thermostability arises from innumerable small changes distributed throughout the protein structure. 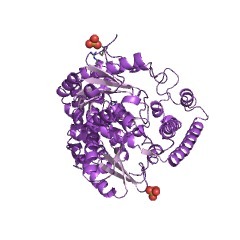 The polymerase domain is highly conserved in all three proteins. The N-terminal domains are highly divergent in sequence, but retain a common fold. When present, the 3'-5' proofreading exonuclease activity is associated with this domain. Its absence is associated with changes in catalytic residues that coordinate the divalent ions required for activity and in loops connecting homologous secondary structural elements. In BF, these changes result in a blockage of the DNA-binding cleft. Comparison of structures from 3 Pol I family members - overlap of polymerase domain, divergence of N-terminal domains. No single explanation for Bst thermostability found.